The challenges of finding the right care home. We understand how challenging it can be to find the right residential care home for your elderly relative or friend. There are so many different types of care home, do you need a nursing home, a care home, a specialist dementia care home or another specialist type of residential home? Once you have an idea of the type of care home you may be looking for, you are then faced with the decision of finding a local home and if you and your elderly relative live a distance apart, should it be near you or near them? How do I find out how good the quality of care provided is? Do they have any vacancies? 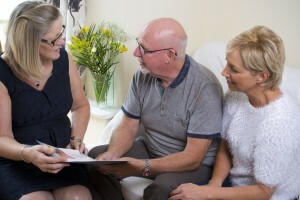 This normally takes place at a time of crisis, as you are usually looking for care because something has happened to your elderly relative which means they can no longer manage at home. Often, this is because they have been admitted to hospital and the hospital is now looking to discharge them, and with the current pressures on the NHS there is additional pressure to find a solution quickly. Why use Clarity Care Consulting? Our care consultants are experts in social care, with many years experience working in social care and of helping to find the right care for others. We know and understand the complexities of the care system. We understand the challenges you face, we know how difficult a decision this is for you and we will help you make the best choice for your elderly relative. We know what to look for when finding care and know the signs and signals as to whether a particular care home will be good for your elderly relative. We are completely independent of any care providers which means we will always find the right care solution for you. Our approach to finding the right care home. Understanding the care you or your relative require. Initially we will speak with you, either face-to-face or over the phone, to fully understand what care is needed, the type of care home that will suit, the location of the home and agree the levels of care home fees that are affordable. Comprehensive research of care homes. We will undertake comprehensive research of the care homes that meet the criteria in the agreed area. This includes reviewing CQC inspection results to ensure the home meets inspection criteria, reviews of customer comments and speaking with the homes to find current charges and room availability. We will visit the care homes that we think are most suitable, so we are able to make suitable recommendations. We will produce and present a shortlist of care homes that meet the agreed needs, have room availability and meet the budget criteria that was set during initial discussions. We will discuss the shortlist with you and agree how best to proceed. You may want to visit the homes yourselves or be happy to proceed with our recommended home. Should you wish to visit the home then we can help arrange the visit if you would like. Arranging and overseeing the transfer. Once a care home has been agreed, we will help arrange and oversee the transfer to the home and monitor how your elderly relative is adjusting to the new care home environment, until we are all agreed that they are happily settled in. We work most frequently in Hampshire, West Sussex, East Sussex, Dorset, Surrey and the Isle of Wight but can work throughout the country, although operation outside of the areas listed may incur additional charges to cover expenses, but we will agree these with you before you commission our services. Once settled into the care home, you may also want to consider our Peace of Mind package, where we continue to monitor the effectiveness of the care being received. This is particularly helpful if you live a long distance away from the care home. How we have helped others find a care home. If you would like to learn more about how we have helped others find a care home, please read our case study. We know how difficult it can be when an older person is no longer able to stay in their own home and we know how challenging it can be when the time comes to have to find a care home for your elderly relative. With an unrivalled knowledge of local residential care homes and nursing care homes, our experienced advisors can help you find the care home that’s right for your relative. We will take the time to understand both their needs and yours, to ensure we find the best care home available. We pride ourselves on being independent, with no ties to any care providers, so you can rest assured that our recommendations are truly independent and are based on inspections from the Care Quality Commission and observations taken when we visit the homes. If you would like to discuss your needs for finding the right care home in more detail, please call us on 02392 251351 or complete the form below, giving as many details as possible about your requirements.